Main Idea: Egypt served as an incubator to develop a new, special nation with its own identity that would replace the evil nation of Canaan and become the center of God's program for the universe. God's promise to Abraham, Isaac and Jacob. Genesis 12:1-3, "The LORD had said to Abram, 'Leave your country, your people and your father's household and go to the land I will show you. I will make you into a great nation and I will bless you; I will make your name great, and you will be a blessing. I will bless those who bless you, and whoever curses you I will curse; and all peoples on earth will be blessed through you.'" The steps to move the infant nation. Joseph born to Jacob's favorite wife, Rachael, and spoiled. Has prophetic dreams about the future, interpreted as egotistical. God has a plan to "unspoil" him and develop a super leader. Sold into slavery by his brothers, coat sprinkled with animal blood. Joseph serves as a servant to Potiphar, rises to position of trust. Falsely accused, ends up in prison, rises to leadership again. Interprets dreams of Cupbearer and Baker while in prison. Pharaoh has dream, Joseph interprets – 7 years of plenty, 7 of famine. But Joseph also has a plan; that's what makes a strong leader, a plan. Pharaoh recognizes God working in Joseph; turn to Genesis 41:38. Joseph becomes the most powerful man in Egypt, except for the Pharaoh; the Egyptian kings did not typically have a "Grand Vizier;" this fact will come into play next week when we try to connect him to Imhotep. Notice how the Egyptian government (Pharaoh) became more powerful than ever – Genesis 47:13-21, 23-27. Joseph saved the lives of millions of people, and God blessed Pharaoh because Pharaoh blessed the descendents of Abraham! Tough to pin down Pharaoh at the time; dating based on date for first dynasty, and Egyptologists differ by 900 years as to when that began! The Twelfth Dynasty ruled from 1991 to 1802 BC, and is considered by later Egyptians to have been their greatest dynasty. First pharaoh to open trade outside Egypt. 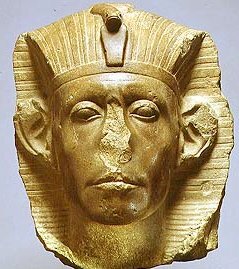 Joseph either begins being Grand Vizier during the era of Senusret II or Senusret III. Most powerful of Middle Kingdom pharaohs. Co-regency lasting at least 1 year. Joseph dies somewhere in this era. *Note: Dating of Egyptian history is very uncertain; dates may literally be off by centuries, although dating becomes more accurate in later eras. The dates given are typically accepted guesstimates, but certainly open to challenge. God is patient, but His patience has limits. Genesis 15:13-16 reads: "Then the LORD said to him, 'Know for certain that your descendants will be strangers in a country not their own, and they will be enslaved and mistreated four hundred years. But I will punish the nation they serve as slaves, and afterward they will come out with great possessions. You, however, will go to your fathers in peace and be buried at a good old age. In the fourth generation your descendants will come back here, for the sin of the Amorites has not yet reached its full measure.'" In 1 Corinthians 10:22, Paul asks, "Are we trying to arouse the Lord's jealousy? Are we stronger than he?" Christians can provoke God's wrath and discipline, just as the Canaanites did. God can remove His blessing from us and give it to others; we should not presume that God's hand of blessing will remain upon us. Those whom He loves, He disciplines. I know many former pastors, former missionaries, former elders, former Sunday School teachers who are on the shelf. God is working behind the scenes. God set Joseph up to deliver his nation from famine and incubate them into a great nation of 2 million. God so worked in Joseph's life that even lost people acknowledged God's presence in him. Do other people see God in us? How God works things out for good is very complex. Genesis 50:20, " You intended to harm me, but God intended it for good to accomplish what is now being done, the saving of many lives." If you could go back in time and try to change world history, you would probably make things worse. Sometimes bad things, as bad as they are, prevent worse things. Suppose you knew September 11th was going to occur. If it was stopped, maybe a worse terrorist act would have occurred. Your alarm fails to go off, you are late for work, but if you had gone on time, you may have had a horrible accident. We can either join God in His plan or resist Him. 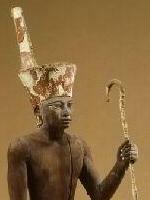 Pharaoh Senusret prospered because He blessed Abraham's descendents and joined in God's plan. A later Pharaoh cursed Abraham, and Egypt was devastated. Have you ever fought God?